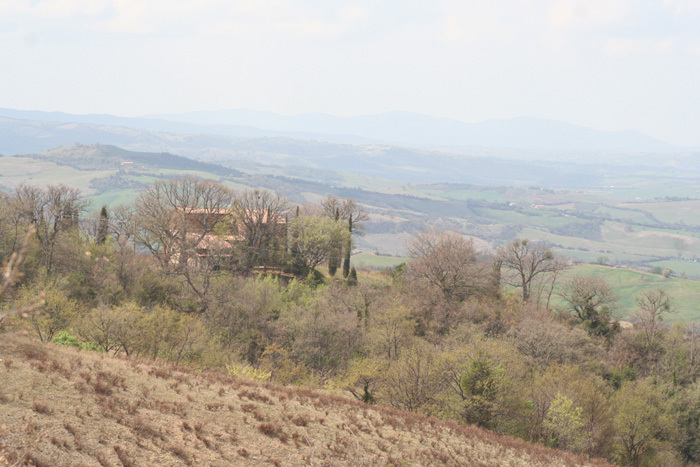 The location of Podere Santa Pia is unique and the landscape a once-in-a-life sight. The Aldobrandeschi castle in Castiglioncello Bandini dominates the valley. Originally there were more then 17 farms connected to the castle, including Santa Pia. The farms were run according to the mezzadria system, whereby proprietor and cultivator shared the profits. Other farms are Podere Siena, Podere La Chiusa, Podere Federano, Podere Santa Margherita and Podere Capraia. Our neighbours are Podere Siena, Podere Santa Margherita and Poderi Firenzi. Podere Siena is situated about 1 km from the medieval village of Castiglioncello Bandini. Podere Santa Margherita, 'La Dimora', is is an old farm that has been renovated into a Bed and Breakfast. Deeper in the valley, in Abandonato, is another Bed and Breakfast, Poderi Firenze. They produce exellent wines.